Brief Synopsis: The failure of the Everyman Project leads to chaos in Metropolis. Issue Notes: Booster Gold does not appear in this issue. Supernova Does. The title of this issue is a pun based on the "Reign of Supermen" storyline that followed the "Death of Superman" story in the Superman comic books of the 1990s. Supernova arrives to confront Lex Luthor about the sudden failure of the Everyman Project. 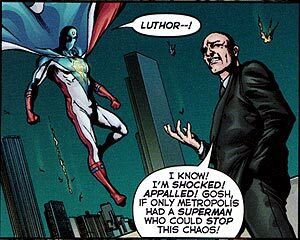 Luthor is unusually dismissive about the situation as he taunts Supernova, whom Luthor believes to be Superman. Supernova clearly is displeased by Luthor's behavior, implying that the two have some sort of history beyond Supernova's peeping in on Luthor's office (as seen in 52 Week Twenty-Two). POWER UP: Supernova uses his teleportation ability to teleport a large mob of people outside of the Metropolis city limits. This is the first time that Supernova has been demonstrated using his teleportation power on such a large crowd of individual citizens. MEET THE PRESS: Supernova is approached by television reporter Ami Soon who accuses him of vaporizing the Metropolis citizens. How quickly the reporters of Metropolis turn on their heroes. First Booster (who was also attacked by Soon following Manthrax's accusations in 52 Week Seven), now Supernova. What is Metropolis coming to? Boosterrific Review: Supernova must act quickly to save Metropolis from the fallout of Lex Luthor's Everyman Project. 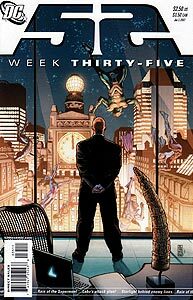 The events in this issue largely stem from the conclusion to the second act of the Luthor plot of the series. As a result, the action of this issue may easily confuse a reader unfamiliar with the events that have led up to this situation. This is not a criticism of this issue so much as it is a warning to a reader who approaches this issue unfamiliar with the 34 issues that went before it.